Via the great TMcG and her post on Charlie Brown, Christmas, jazz, and Buddhism, I was remind of the following post I wrote way back in 2004. I am resisting the strong urge to edit. It’s an old post; I’d like to believe that I’ve changed — grown, matured — in the intervening seven years. (If nothing else, back then I was still in school, living alone with dog who’s since passed away. I’m writing this now with one hand since my four-month-old daughter is sleeping in my lap.) So I’d probably say some things a bit differently now, but I’m going to let it stand as is. There’s still a good message buried in here somewhere. The world’s changed a lot since 2004; but in many ways, it’s very much the same. So I was just watching the Simpsons and, after it was done, rather than turning the television off, I flipped around for a bit and stumbled across “It’s a Charlie Brown Christmas.” I know this is a special that’s on every year ’round this time, but I can’t recall the last time I actually sat and watched the whole thing. 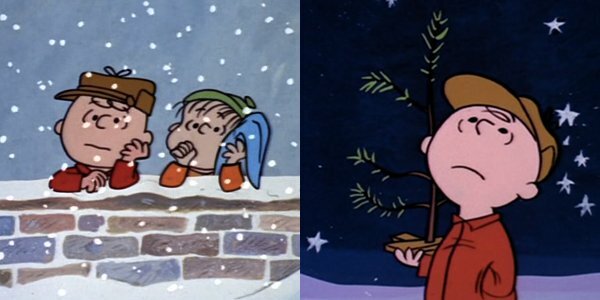 All I remember are the iconic symbols — the Christmas tree whose needles fall off, the silly dance steps the kids have to Schroeder’s piano, Snoopy trying to kiss Lucy and steal Linus’ blanket — but I must’ve missed some of the message when I was a kid. I mean, I know it’s Christmas, so it’s gotta have something to do with Christ. What’s more, I forgot that the whole reason Charlie Brown was depressed to begin with was because Christmas had gotten too commercial. I gotta tell ya. There’s something wonderful about watching this quiet little show telling us to practice peace on earth and good will toward men without getting hung up on commercialism smack in the middle of twenty minutes of commercials for Office Depot and T-Mobile. When I was a kid, my family always associated me with Schroeder because I played the piano. But secretly I always identified with Linus. Watching tonight, I see Linus in a whole new light. He’s the archetype for the voice of Moral Reason in any and every comic strip and cartoon since. There’s some of Hobbes in him. Some of Lisa Simpson. He’s the perfect antithesis of his older sister Lucy who gets her way on her good looks and brute force. Linus asks her to give him one good reason why he should memorize his lines for the Christmas play. “I’ll give you five good reasons,” she replies, shaking a fist. She tells Charlie Brown that she’s always depressed after the holidays because she never gets what she really wants. “What do you really want?” Charlie Brown asks. “Real estate,” is her reply. She’s an icon for America’s capitalist-driven imperialism. Linus, on the other hand, follows the downtrodden Charlie Brown around clinging to his blanket and sucking his thumb in his iconic, fetal way and when finally asked “What’s Christmas all about?” he takes center stage and says, “Lights please,” which dim even though there are no grown ups to dim the lights for him (he even controls the gods), and gives a simple and eloquent reading of a Bible passage to explain to the stunned school-children the true meaning of Christmas. I don’t even like Christmas anymore. Like Charlie Brown, I’m sickened by the rampant commercialism of the whole affair and the odd sort of deceit implied by the whole thing. I mean, America as a whole is expected to celebrate Christmas, to buy gifts, to eat too much, despite the fact that it’s a Christian holiday. The Christian message is just conveniently left out. But unlike Charlie Brown, I can’t go off and buy a limp Christmas stick and hope that my friends and family remember the birth of Christ — because few of my friends and family members are Christian. And, more importantly, neither am I.
I miss Thanksgiving. Thanksgiving seems to be a better message. And I don’t mean the myth of Thanksgiving, the mystic and complete fabrication of peaceful Puritans and Indians gettin’ together for some good food. That never happened. I mean, maybe it happened. But the blood of turkeys wasn’t the only blood to hit the ground that day. Thanksgiving as a national holiday didn’t happen until 1863. And it was Lincoln who made it happen. And he used the occasion to get people to stop fighting for a change. I like the idea of a holiday dedicated to getting people to reflect on the good things in their lives and stop fighting for a change. I know I’m picking my history here, but there aren’t a lot of good holidays left. I mean, no one in my family is a Buddhist. No one’s buying Bodhi-day presents. So an anti-capitalist cartoon gets air-time every year. That’s something. I hope people can hear it, even if I don’t worship the same savior. It’s a nice sentiment. And I’d like this rant to end on a high note after all. It is the holiday time and there are reasons to celebrate and there is work to be done in the New Year for peace and hope and all those things. And I don’t know how many more rants I can crank out before I go on my vacation, so it would be nice to end on a high note. But there’s something to be said for brute honesty. The most important thing for any of us to do this holiday season is to take stock of the beautiful things in our lives, give thanks that we have them, and work for peace in the coming year. It is a time to be compassionate and mindful in a real and lasting way. All good things that have nothing to do with Amazon.com or Wal-Mart. So happy holiday, whichever winter holiday you love most. This entry was posted in personal and tagged archives, capitalism, Charlie Brown, Christmas. Bookmark the permalink. I’m thrilled that the Charlie Brown post resonated. When we strip out all of the commercialism and hoo-ha of the holidays, there is something quite beautiful that remains for those that understand that the holiday season is about more than gifts, gifts, gifts. For me, the soundtrack really resonated. The songs range from absolute depressing dirges to peppy puppy jumping jazzy tunes and each time I hear the soundtrack, it goes beyond the label of Christmas and into just perceiving songs that were crafted by musical masters who knew how to convey emotions through their notes. Onwards to an awesome and compassionate 2012!